Like Christianity, Judaism, and many other religious groups, there are subdivision, and variations of Jamaican Rastafarians. Some of these subdivisions are closely related to the Jamaican Rastafarians, whereas some may be considered very separate. Within all subdivisions, however, there are two characteristics that they have in common: “the exalted status of Haile Selassie I and the rejection of white Eurocentric images of divinity” (Minority Right's Group International, 2008, para. 16). There are three main subdivisions, which include The Nyahbinghi Order, The Twelve Tribes of Israel, and The Bobo Shanti. The oldest subdivision, the Nyahbinghi Order, is named after queen Nyahbinghi of Uganda (BBC, 2014b). Members of the Order focus primarily on Emperor Haile Selassie, and that he is the embodiment of God (Minority Rights Group International, 2008). This Order values Ethiopia highly, because they believe that all black people came from there. Because it is so important to them, Ethiopia plays a large role in almost all aspects of the tribe, and can even be found on their flag, which is sometimes a bit different from the Jamaican Rastafarian’s flag (BBC, 2014b; Minority Rights Group International, 2008). The Twelve Tribes of Israel, which was founded by Dr. V. Carrington, is the most liberal subdivision, in which people are allowed to worship where they please—be it a church of their choosing, or elsewhere (BBC, 2014b; Minority Right's Group International, 2008). Members of this subdivision consider themselves to be direct descendants of the sons of David. In this group, there is division, based on birth month, into twelve different houses, which are each represented by a different color (BBC, 2014b; Minority Rights Group International, 2008). In being the most liberal group of the three main subdivisions, this tribe believes in the salvation of not only blacks, but also any other race (BBC, 2014b). ﻿The Bobo Shanti began in the 1950s, and was founded by Prince Emanuel Charles Phillips. He was a very important figure in this subdivision, as the Bobo Shantis believe he is the “Black Christ” (Minority Rights Group International, 2008), and that he, Marcus Garvey, and Haile Selassie are components of a holy trinity (BBC, 2014b). 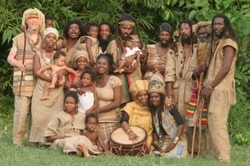 Because Bobo Shantis are so separate, they are able to have their own economic system- an aspect of culture that most other Rastafarian subdivisions do not display. This portion of Rastafarianism is so separated from the rest of Jamaica that it has unofficially become a separate nation within Jamaica” (Minority Rights Group International, 2008). This means that it has its own constitution, laws, and economic structure. They do not accept the laws of Jamaica, nor do they rely on Jamaica to support their community. The economy of these people, according to the Minority Rights Group International (2008), relies solely on their production and distribution of straw hats and brooms. This is one of the few examples found where a Rastafarian community has its own economy, and system of government (BBC, 2014b; Minority Rights Group International, 2008). In this government, there are several rules that further differentiate their section from the other subdivisions. One such difference is their dress code, which reaches the extreme of most other Rastafarian communities. People of the Bobo Shanti subdivision must wear robes and turbans, which typically cover most of their bodies (BBC, 2014b; Minority Rights Group International, 2008). The women also have to wear long sleeves, and are covered almost completely head to toe. Besides their dress policies, their laws are closely related to those found in the New Testament (Minority Rights Group International, 2008). Such laws include their fasting twice a week and on the first day of each month, observing Sabbath as beginning sundown Friday, and lasting until sundown Saturday, laws that affect women while they are menstruating, and special greetings between one another (Minority Rights Group International, 2008). The last major differentiating characteristic is the fact that Bobo Shantis do not smoke ganja in public, they feel that it is a private act that should take place only during worship with other members (Minority Rights Group International, 2008).